FABER-COM offers a qualified, efficient and fast customer service, from the telephone support to the direct action on the field. Launch of the new rechargeable battery type 592 for Scanreco RC400 G1, G2, G2B, G3 and G4 Executive. Discontinued availability of Portable Control Units type 960, 999 and 777 for Scanreco RC400 radio remote controls G1. Discontinued availability of spare parts type 344, 509, 380 and 507 for Scanreco RC400 radio remote controls G1. New Portable Control Units type 888 and Receivers type 1500 for Scanreco RC400 radio remote controls G1. Technical changes on hydraulic proportional modules for Walvoil SD series valves. For each service request you can directly call our professional Team. Available daily service, from Monday to Friday during OFFICE HOURS, to reply to all your requests. Our company had ISO9001 certification, in August 2011. 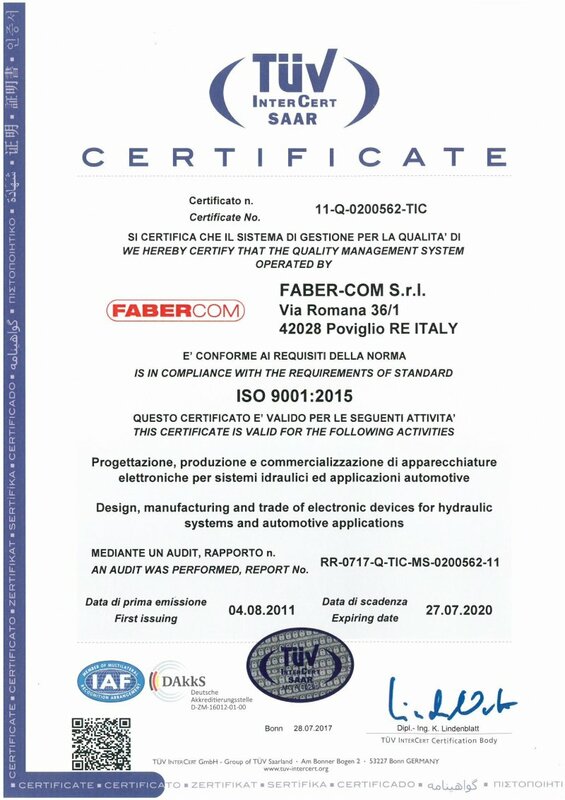 Faber-Com develops control systems specifically designed for each type of hydraulic machine, customising our devices according to our customers' requirements. CLICK HERE TO FIND OUT WHICH SOLUTIONS WE CAN PROPOSE YOU FOR YOUR APPLICATIONS.